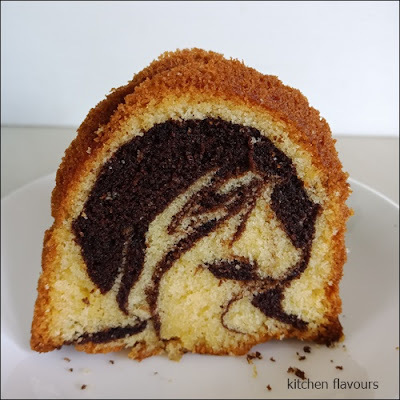 I like marble cakes, and have tried quite a number of recipes from various cookbooks. This marble cake is different from the rest as there's melted white chocolate mixed into the plain batter. Since there's dark chocolate used for the chocolate batter, then why not white chocolate for the plain batter, a delicious idea! A lovely recipe, from the cookbook, Classic German Baking, which is fast climbing its way up in the list among my top favourite baking book. The author, Luisa Weiss, got this recipe from her assistant, Maja, which is her family recipe. The only change I made was to reduce the sugar to 170gm. 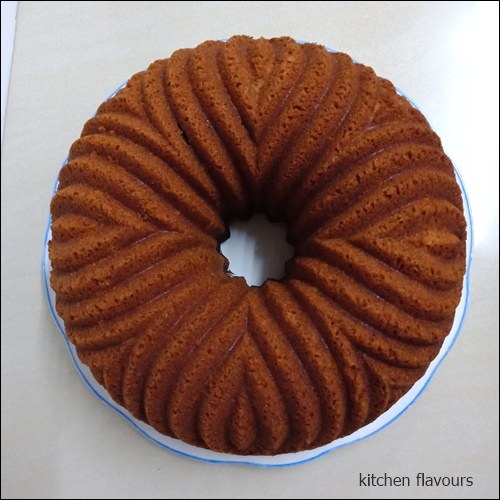 This cake is baked either in a Gugelhupf or bundt pan. I've used my bundt pan and bake for exactly 45 minutes. Cake is moist, with soft closed crumbs. The white part of the cake with an almost velvety crumbs, best as described by the author on the melted white chocolate in the batter "Don't worry, this doesn't make the batter taste of white chocolate. When the cake is baked, the white parts simply tastes richer, toastier, and more complex". A slice or two is very nice with either coffee, tea or just a glass of milk. A sweet friend gifted me with a packet of conchiglie, a jumbo size shell-shaped pasta, used for filled pasta recipes. I found the perfect filling, a recipe of Gino d'Acampo, Spicy Pork and Tomato Sauce. His recipe uses small shell pasta which are tossed with the cooked sauce before serving. 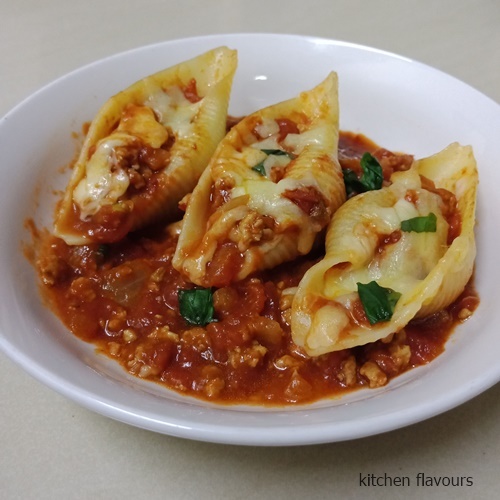 I have however made the sauce and fill the jumbo shell pasta with it, arrange on a baking dish, scatter some mozzarella cheese on the top, and bake for about 20 minutes until the cheese melts. The filling is very tasty. I have added a can of chopped tomatoes because I wanted more sauce. And used chilli flakes, about 1 tablespoon instead of fresh chopped chillies. Other than that, I followed the recipe as written. There's sun-dried tomatoes in oil, chopped olives, passata, onions and minced pork. Such a tasty and delicious sauce! We've enjoyed this delicious pasta for dinner and I will make the sauce again, to serve over spaghetti the next time. The recipe for Spicy Pork and Tomato Sauce can be found from his website here, or from his book, Gino's Pasta. 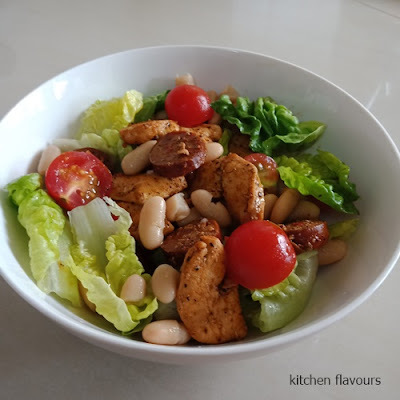 A simple, easy and very delicious lunch of Chicken and Chorizo Salad. I've used only cannellini beans, omitted the barlotti beans (did not have any). Instead of using sliced red chilli, I have used 2 teaspoons of chilli flakes. Did not have rocket leaves either, so I have used baby romaine lettuce leaves. This plate of salad makes a very nice and tasty lunch. Put all the beans in a large bowl with the tomatoes, chilli and garlic. Pour over the lemon juice with half the olive oil, season with salt, toss all together and set aside. Place a large frying pan over a high heat and pour in the remaining oil. Add the chicken strips and fry for 5 minutes, stirring occasionally with a wooden spoon. Season with salt, add the chorizo and continue to fry for a further 2 minutes over a high heat. Toss the rocket leaves through the bean salad and transfer to a large serving plate. Top with the crispy chicken and chorizo and serve immediately. 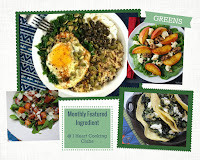 This week at I Heart Cooking Clubs (IHCC), we are cooking Greens! I'm cooking with Nigel Slater for this week's theme. 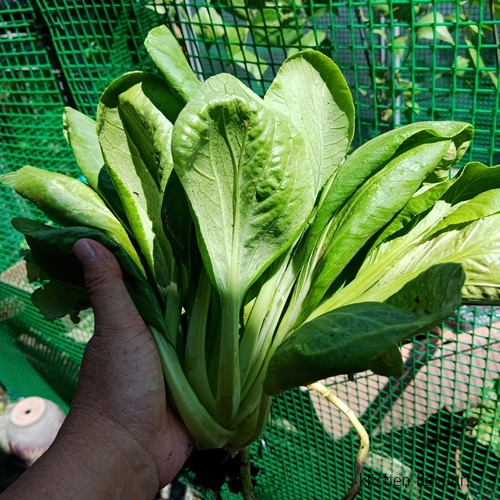 I have a few bunches of pak choy in my garden containers that are ready to be harvested and they are perfect for this simple stir-fry dish. 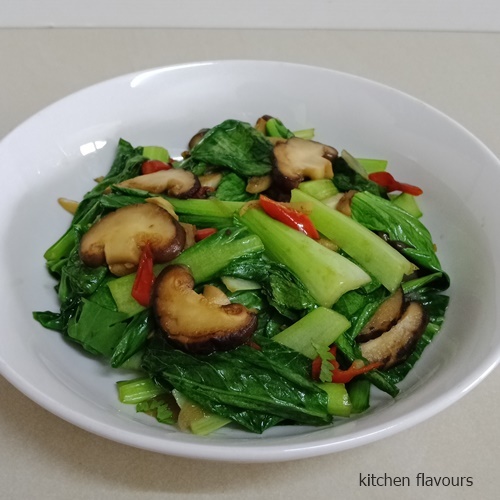 A simple and tasty stir-fry greens. 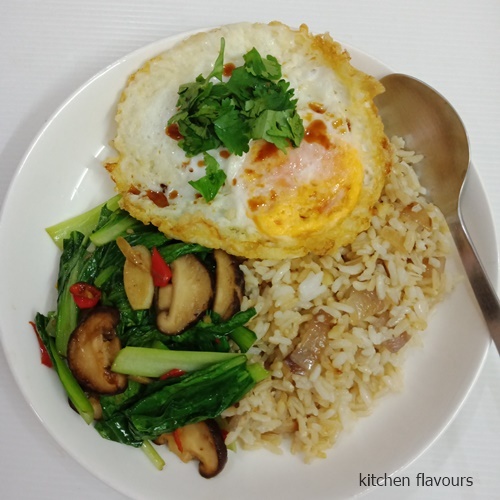 Makes a great side dish with some fried rice and of course, with a fried egg for a complete and filling meal! Peel and finely shred the shallots. Peel the garlic and slice it finely. Halve the chillies, discard the seeds and cut the flesh into thin shreds. Cut the mushroom in half. Shred the greens finely. This is easier when the leaves are piled on top of one anotheer and rolled up like a cigar. Get a wok or large, thin-bottomed pan really hot. Pour in the oil and then, just as it starts to smoke, add the shallots, garlic, chillies and ginger. Stir-fry them for thirty seconds or so, till they are fragrant and just beginning to colour. Add the mushrooms and let them colour appetizingly, moving them and the aromatics around the pan regularly. Add the shredded greens and continue cooking till they have softened but are still bright and vibrant in colour - a matter of two or three minutes. Add the fish sauce, caster sugar and soy. Wait till everything is sizzling, then throw in the coriander, toss and stir, and eat immediately. Monthly Featured Ingredient : Greens ! Made it for myself since I am always alone for breakfast, so I've used only 1/3 cup of oats. Did not have any bananas, so I've cut some apple slices and added some homemade granola on top. Used dried cranberries instead of dried cherries and the lovely golden sultanas are a gift from my neighbour during one of their travels abroad a couple of months ago. I did not drizzle any syrup or brown sugar, even though I had my jar of orange blossom honey close by. 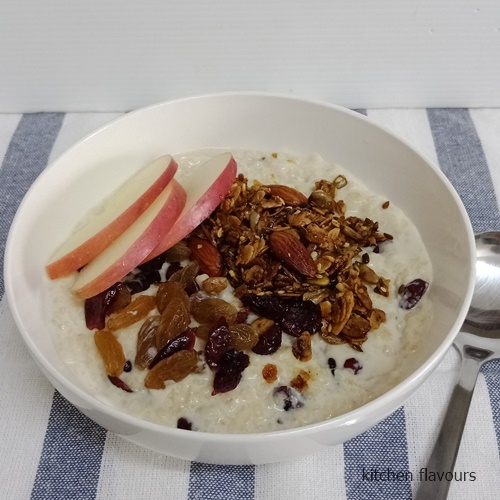 The oatmeal is sweet enough from the dried fruits and the granola. I can say that this is a nice breakfast even though I am not an oatmeal person, maybe I'll try a savoury one the next time. Heat the milk plus 2 cups of water in a medium saucepan until it starts to simmer. Add the oatmeal and salt, bring to a boil, then lower the heat ad simmer for 4 to 5 minutes, stirring occassionally, until thickened. Off the heat, stir in the bananas, cherries, and raisins. Place the lid on the pot and allow to sit for 2 minutres. Serve hot with maple syrup or brown sugar and extra milk. A simple easy and tasty pasta dish, a recipe from Gino D'Acampo. Have you heard of him? I first watch him cook when he was a frequent guest chef at Saturday Kitchen, a BBC cooking show hosted by Antony Worrall Thomson, that was years ago. I've used streaky bacon as pancetta is not easily available. And I've added more chilli flakes, which gives a mild spicy taste to the sauce. I made this pasta for a weekday after school lunch, and it was delicious. One that I would not mind making again, as it is quick, easy and tasty! Bring 5 litres of water to the boil in a large saucepan with 1-1/2 tablespoons of fine salt. Heat the oil in a medium saucepan over a medium heat and fry the onions for 3 minutes, stirring occasionally with a wooden spoon. Add the chilli and pancetta and continue to cook for a further 5 minutes. Pour in the chopped tomatoes, stir well and gently simmer for 10 minutes, uncovered, stirring every couple of minutes. Season with salt once the sauce is cooked. Meanwhile, cook the pasta in the boiling water until al dente. 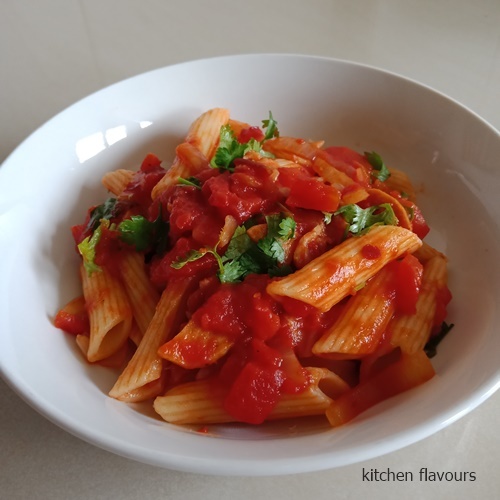 To get the al dente perfect bite, cook the pasta for 1 minute less than instructed on the packet and always keep the pan uncovered. A good-quality dried pasta will take 8-10 minutes to cook. Once the pasta is cooked, drain and tip back into the same saucepan in which you cooked it. Pour over the sauce, add the parsley and stir together for 30 seconds allowing the flavours to combine. Serve immediately with a large glass of Italian red wine. If you have any of Gino D'Acampo's cookbooks, join us at Cookbook Countdown. This month's theme at CC is cooking from any of Gino D'Acampo's books. 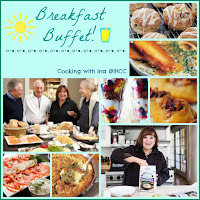 Or simply cook from any of your cookbooks (not necessarily Gino's) or magazines and link your post at CC here. It is Potluck Week at I Heart Cooking Clubs (IHCC). I've made a lovely dessert from Yotam Ottolenghi/Helen Goh's cookbook Sweet. It's a nice rich sweet dessert made with heavy cream. 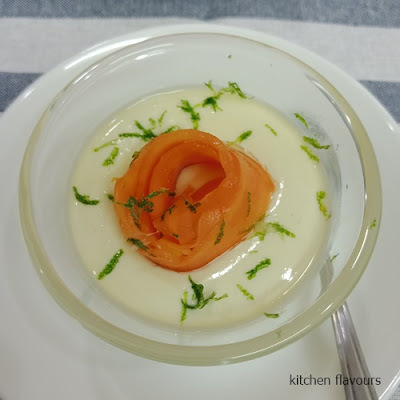 What I like about this dessert is, it is infused with the fragrance of tropical flavours ; kaffir lime leaves, limes zest, lime juice and fresh papaya, all of which are easily available over here, anytime of the year. 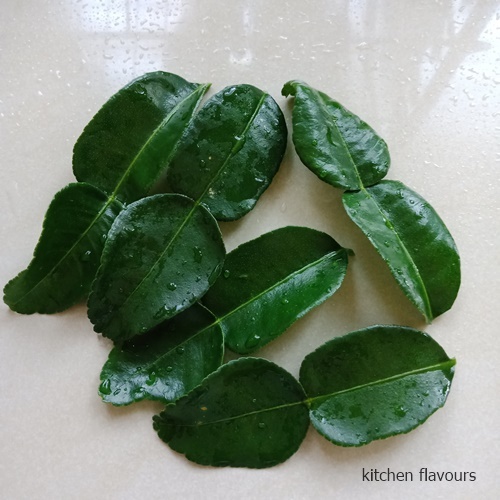 Fresh Kaffir lime leaves, from my garden pot. The aroma of the leaves is like no other! Heavy cream is heated with shredded kaffir lime leaves and shreds of lime zest, then left to infuse for half an hour. Add sugar with a pinch of salt to the cream and heat until the cream bubbles and rises. I did reduce the sugar to only 4 tablespoons (about 50 gm). 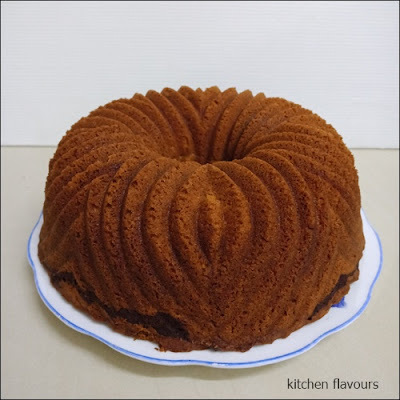 The original amount for the sugar is 140gm which I've guessed would be too sweet for us, that was why I started with only 4 tablespoons, and after tasting the mixture when the sugar has fully dissolved, I found that the balance is not needed, 4 tablespoons is just perfect! Strain the mixture into a heatproof measuring jug, stir in one tablespoon of lime juice, the cream will thicken, then pour into ramekins or bowls. Refrigerate for at least 6 hours or overnight. Right before serving, place slices of papaya on top, sprinkle with some finely grated lemon zest, with a teaspoon of lime juice in each bowl. 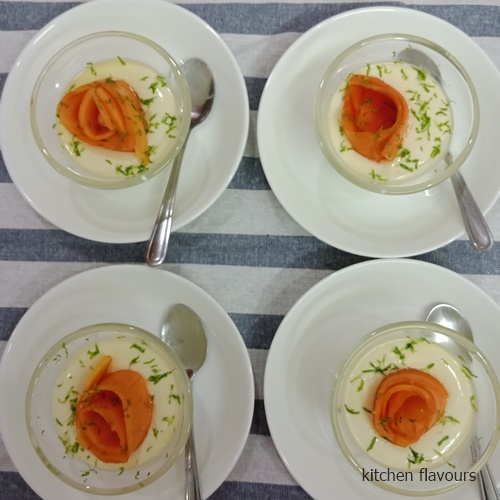 This posset makes a lovely after dinner dessert. It has the lovely fragrance from the kaffir lime leaves. And with the added lime zest and juice, helps cut the richness of the cream. Not too sweet, just right! We've enjoyed this dessert very much! This lovely dessert recipe is from Sweet, a cookbook by Yotam Ottolenghi and Helen Goh, or you can get the recipe at this link. The only changes I've made is to reduce the sugar to 4 tbsps (about 50gm).